It’s hard to say which came first, the sail plan or the spar plan, there was a great deal of interaction between the two. But we do know that the result is a sail plan with a high aspect ratio, and the main is slightly larger than the just barely overlapping jib. A staysail can be set instead of the jib (or conceivably inside the jib). A masthead spinnaker finishes our initial suit of sails. The sails were all designed and built by Maine Sailing Partners. The main and jib are both Hydranet Radial 433 from Dimension-Polyant, a woven material of polyester and Dyneema. The staysail is 11oz Dacron and the spinnaker is Airx 900 from Bainbridge. 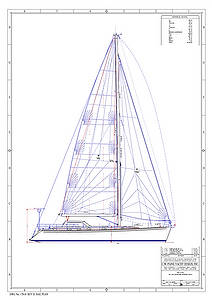 The 705 sq ft. (65.6 sq meters) main is the workhorse of the sail inventory. We do not carry a storm trysail as I felt it added complexity at a time when we would already be very busy. Instead, the main has three reefs, the third reef having about the same sail area (35%) as is specified for a trysail by the ORC. The main is reefed by old school two line slab reefing. There is a more detailed description of the reefing system and process in the description of the Cockpit and Deck Plan. To control the main when raising and dropping the sail we use the Dutchman Sail Flaking System. This consists of four vertical lines woven through the sail which causes the sail to flake onto the boom. The system is simple, inexpensive to maintain and never snags the battens which is a common problem with lazy jacks. To further simplify the system, and improve safety, we eliminated the traveler and rely upon a hydraulic vang for leech control. We spend a lot of time sailing off the wind where the vang is critical. The vang also takes a lot of abuse as the main moves around in a seaway or when the main slats (which can happen in as much as 15-17kts in a following sea). The original recommendation was to use a VC 22 cylinder but this was upgraded to a VC 30 cylinder to increase reliability. The last piece of the mainsail control system is the outhaul which is also hydraulic. All of the hydraulics are controlled from a single manual Navtec panel on the port side of the cockpit. The jib is slightly smaller than the main at 632 sq ft (58.7 sq meters) and is set on a Harken #3 Mark IV furler. The staysail is set on a removable kevlar inner forestay with soft hanks. The spinnaker is 1,800 sq ft and is set/dropped using an ATN sock. We do 95% of our sailing with just the main and jib and we’re be happy to see the staysail stay in the bag! Since the jib is slightly smaller than the main, but tacks to a much lower point than the main, we have a fractional rig to produce a jib that could be controlled and useable off the wind. With a masthead rig the jib would have been even taller and the top sections of the sail very, very narrow for a boat that does most of its sailing off the wind. As usual our goal was to balance our twin interests in performance and safety. Experienced sailors know that the most dangerous thing on the boat is the boom (followed by the calendar). Numerous sailors, both novice and experienced have been killed, directly or indirectly by a swinging boom. We were very aware of this on our last boat and one of our goals was to take the boom out of the equation. Fortunately this was an area where the trade off between performance and safety was not difficult. From a safety perspective, the hard dodger governed the minimum height of the boom above the cockpit sole and the result was that the boom could not possibly strike any crew member less than 7’ tall. From a performance perspective, a higher aspect ratio sail plan (i.e., vertical / horizontal dimensions) is more efficient for upwind sailing and not a significant detriment to downwind sailing. One result of a higher aspect ratio sail plan is that the boom is shorter. In our case the boom barely extends past the end of the hard dodger. This again contributed to safety since when steering or adjusting the sails we are always aft of the end of the boom. A higher aspect sail plan resulted in better safety, visibility and performance. Chuck Paine’s challenge was to balance the sail plan with the righting moment of the boat (i.e., its desire to stay upright or resist heeling). This is where many factors interact. The higher the aspect ratio of the sail plan, the higher the center of effort of the sails and the greater heeling force they generate. 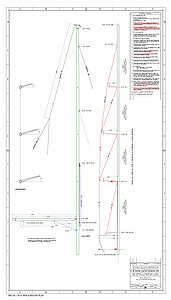 The taller sail plan also results in a taller mast and the increased weight of the mast, rigging and spreaders then contribute further to the heeling force. These heeling forces can be offset by either a deeper keel or a heavier keel. But a heavier keel will result in a heavier boat overall which then requires more sail area to move the boat through the water (like a heavier car needs a bigger engine), which in turn creates more heeling forces necessitating a heavier or deeper keel, etc., etc. A heavier keel means the boat sits deeper in the water which changes how the hull should be shaped. Racing boats solve this problem with a deeper keel, but as discussed earlier that introduces other benefits and problems. I could go on and on, but suffice to say there is where Chuck’s design expertise and experience was really critical. He did a great job of balancing all of these tradeoffs to achieve the best possible performance, adjusting the sail plan and keel design to balance all the relevant forces. The high aspect sail plan has other impacts on the rig. As mentioned above, the weight of the mast, boom, spreaders and rigging are a significant factor. Changing the weight of the mast and rigging by 100 pounds has a big effect on the heeling forces when they rise seven stories above the deck. As such, one of the first things we had to decide was whether or not to build the mast of aluminum (less expensive, but heavier), or carbon fiber (more expensive, but lighter). A lighter carbon fiber rig offered a number of benefits in reducing both heeling forces, and pitching (rocking fore and aft). We were fortunate to be able to specify a carbon fiber rig. We also selected stainless steel rod rigging (shrouds, forestay, and backstays) which is more durable and stretches less than stainless steel wire. It is also a more proven and serviceable material than the dramatically lighter PBO or synthetic rigging that is now common on racing boats. However, the rig is perhaps the area where the design details are most in the hands of the supplier. Chuck freely admitted that with a carbon fiber rig he had no specific knowledge of the mast and boom sections, or their final weight. These are the closely guarded secrets of the mast builders and complicated Chuck’s design problem. We put the initial spar out to bid with three spar builders and then selected Offshore Spars. They were absolutely fantastic to work with both before and after delivery of the rig. They continue to provide outstanding support and I can recommend them without hesitation. There were two areas of the rig design where I did have specific input. The first was on the angle of the spreaders. Swept back spreaders provide additional support for the mast, but limit the degree to which the boom can be eased when sailing downwind; another performance or safety trade off. We decided the increased mast safety was a significant benefit and compromised on 16 degrees of sweep. One side effect of the outboard shrouds is that the D1 (lowest diagonal shroud) cuts across the side deck. After a week of bumping my head on the D1 of a bareboat charter boat in Croatia I came back and specified that the D1 would terminate inboard, but continue to terminate the vertical shrouds outboard. Offshore Spars then advised me that we would need three spreaders due to the narrower base of the D1, but the three spreader rig would be lighter than the two spreader rig. So I didn’t have to worry about bumping my head and we reduced the weight of the mast; a twofer. Overall we have found the sail plan to provide a lot of flexibility. With just the main and jib we’re able to shift gears from the full main and jib, to one or two reefs in the jib and one, two or three reefs in the main. These various combinations provide a lot of flexibility for increasing or decreasing our power. We’ve sailed for several days in just 6-8kts of breeze (upwind with smooth seas) and in a steady 20-30kts (though not above 30 kts for any extended period) by changing our jib and main configuration. A few more details: The backstay was split to provide unencumbered access to the cockpit from the swim platform. The inner forestay and running backstays are all Kevlar. 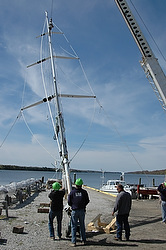 A carbon fiber spinnaker pole is stored on the mast. Additional details are in the final proposal from Offshore Spars.